FOR ALL YOUR TIKI-RELATED NEEDS. 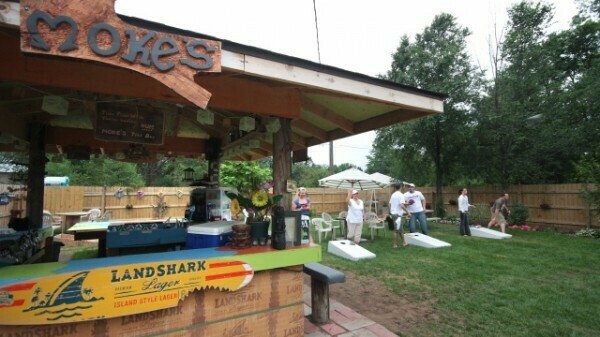 Mokeâs in Hallie is a summertime bar and grill with an outdoor tiki bar and a bean bag court. Looks like they got Land Shark in the cooler. Hey you. Are you listening? Lean in closer. I’m going to tell you about one of Wisconsin’s best kept secrets. It’s about Moke’s Bar and Grill in Hallie. Named after owner Nate Moquin’s late father, Moke’s looks like any other Wisconsin bar from the outside, but take a step inside the backyard and prepare to be surprised. Approach the high wooden fence and hear Jimmy Buffet piping out into the street. Cross the threshold and behold all Moke’s has to offer by way of entertainment, from Hammer Schlagen and billiards to ladder golf and bean bags. In one corner sits a stage, where bands play most Friday, Saturday, and Sunday nights. “You can’t describe the ambiance until you see it,” Moquin said. Perhaps the most unique thing about Moke’s is the massive full-service tiki bar. The bottom is made of small pieces of bamboo, and authentic Mexican masks hang from the ceiling. “I really tried making it look as authentic as possible.” Moquin said. The tiki bar is also rarely without their mascot Colby, a fun-loving bulldog. Although the bar has been around for quite a while, Moquin didn’t take over management until April of 2007. “When we bought the bar from the previous owners, who’d been in the business for 30 years, we kept the menu the same. Exactly the same, no changes. These people were notorious for their food,” Moquin explained. Why mess with a good thing? Moquin recommends the pizza to first-timers. One of Moke’s cooks, Michelle, whipped me up one of their famous pepperoni pizzas, and let me tell you, it exceeds its reputation. In the current economic times, many people shy away from the price of eating out, but Moke’s prices are extremely affordable. The entrees range from $5 to $9, and drinks from $2.50 to $4.